Astronaut photograph ISS013-E-23272 was acquired June 8, 2006, with a Kodak 760C digital camera using an 800 mm lens, and is provided by the ISS Crew Earth Observations experiment and the Image Science & Analysis Group, Johnson Space Center. The International Space Station Program supports the laboratory to help astronauts take pictures of Earth that will be of the greatest value to scientists and the public, and to make those images freely available on the Internet. Additional images taken by astronauts and cosmonauts can be viewed at the NASA/JSC Gateway to Astronaut Photography of Earth. Tenerife is the largest of the Canary Islands, a Spanish possession located off the northwestern coast of Africa. Formation of the islands may have begun approximately 30 million years ago, although the oldest lavas found on Tenerife indicate a much younger age (approximately 8.5 million years before present). The islands in the chain could have been produced by eruptions of basaltic shield volcanoes as the African tectonic plate moved over a stationary hotspot, much like the formation of the Hawaiian Islands. A different hypothesis relates the Canary Islands to magma rise along underwater faults during the uplift of the Atlas Mountains in northern Africa. The island of Tenerife exhibits many volcanic features. 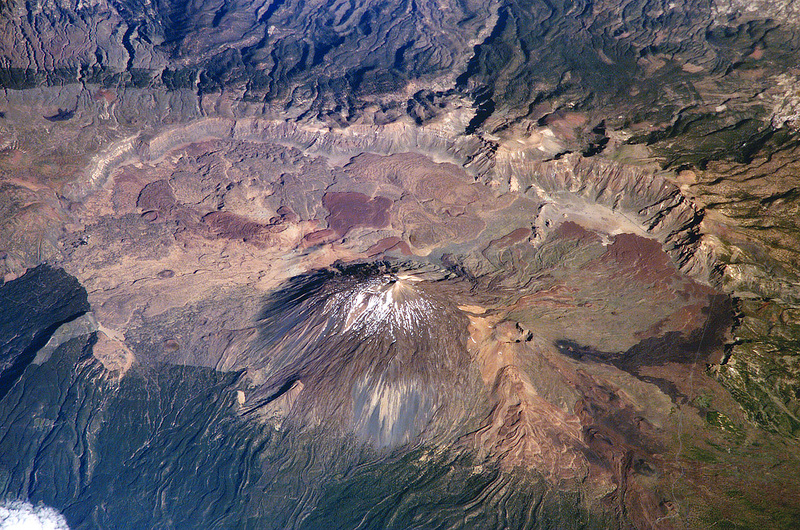 The central feature of this astronaut photograph is the elliptical depression of the Las Cañadas Caldera that measures 170 square kilometers (about 65 square miles). A caldera is typically formed when the magma chamber underneath a volcano is completely emptied (usually following a massive eruption), and the overlying materials collapse into the newly formed void beneath the surface. A large landslide may have also contributed to (or been the primary cause of) formation of the caldera structure. If that explanation is correct, part of the original shield volcano forming the bedrock of the island would have collapsed onto the adjacent sea floor, forming the large depression of the caldera. 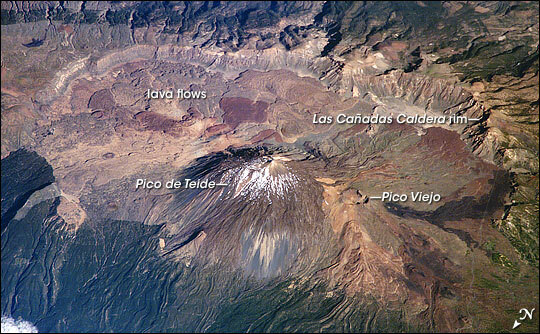 Following formation of the caldera approximately 170,000 years ago, the composite volcanoes of Pico de Teide and Pico Viejo formed. Teide is the highest peak in the Atlantic Ocean, with a summit elevation of 3,715 meters (approximately 12,200 feet). This type of volcano is a stratovolcano, a steep cone formed by alternating layers of dense lava flows and fragmented rocks ejected by explosive eruptions. Many linear flow levees appear along the flanks of Teide Volcano extending from the summit to the base. A large circular explosion crater marks the summit of Pico Viejo. The floor of the Las Cañadas Caldera is covered with tan, red-brown, and black irregularly lobed lava flows, the eruptions of which have been observed by settlers and seamen—possibly including Christopher Columbus—since 1402. The most recent eruption occurred in 1909, and the island of Tenerife is actively monitored for further activity.